The ‘classic’ Cement Life Preserver goes back to the ‘early’ ISO days. The question was (is? ): Can a company be registered and make a cement life preserver? The answer is, YES - if that’s what they have designed and the product meets the design. The word quality is much overused. The definition of quality is debated every day. The evolution is evident in the document name changes. See https://elsmar.com/ubb/Forum5/HTML/000063.html for a discussion of the definition, and to get a sense of the evolution of the definition of, Quality. 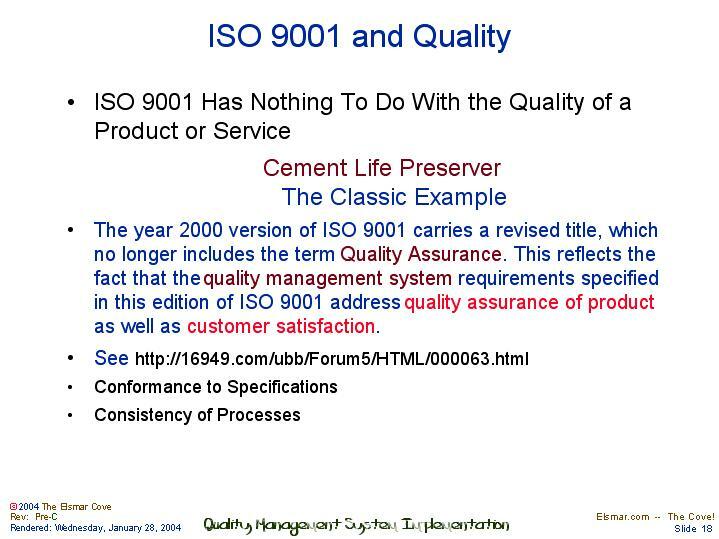 The year 2000 version of ISO 9001 carries a revised title, which no longer includes the term Quality Assurance. This reflects the fact that the quality management system requirements specified in this edition of ISO 9001 address quality assurance of product as well as customer satisfaction.